YOU'RE READING Was this ad purposely made racist to get more airtime? Dutch beer maker, Heineken is making waves for its latest, highly controversial ad. 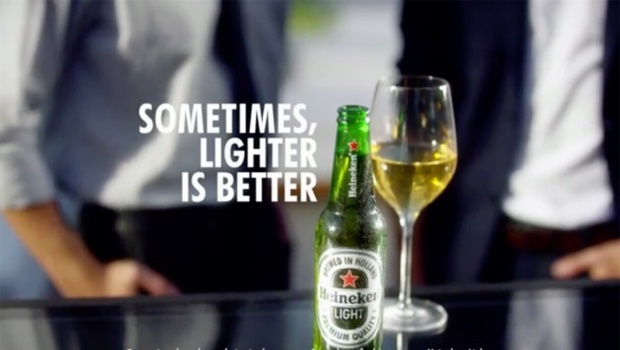 In the video, a barman is seen sliding a Heineken beer past three black people before stopping in front of a lighter-skinned woman and a glass of white wine, when the slogan reads “Sometimes, lighter is better”. Trevor Noah featured the ad on a segment of the Daily Show and spoke about how perhaps ad companies are now just making racist ads because the only time we really get to see commercials now (PVR and video-on-demand or internet TV is on the rise) is when they’re in the news for being controversial. READ MORE: Castle Lite issued an apology to women – are we buying it? But Trevor’s not the only one who thinks the beer company might be up to something. Chance the Rapper tweeted his distaste at the ad also speculating that it was made this way intentionally. Does all press is good press analogy work here, perhaps? We remember all of those brands that have offended, like you’ll always remember that Dove clear skin ad or the H&M monkey sweatshirt picture. But in the end very few of us ever really boycott them. We hold them to account on Twitter, but how about IRL? READ MORE: Female-friendly chips - just another way to silence women? It might be for something bad, but brand awareness is still brand awareness at the end of the day. You still know that the brand exists and might be curious about their products. So in the end the brand itself still wins. In a previous article on W24 we featured a poll asking our readers “Have you ever really boycotted brands after they've done something you didn't agree with?” 29% said not really. So are we quick to forgive brands who do stupid things for publicity? Do we forget their transgressions? And we simply move on to the next thing and continue shopping their products because it’s easier to ignore the issue than it is to take a stand and say that you will not be associated with a brand that uses racism or any other kind of controversy to sell their products? In an article for the BBC, Paul MacKenzie-Cummins, managing director of Clearly PR Marketing and Communications says it seems like a lot of brands really are trying their level best to get attention any way they can: “They're clever people, those who work in ad agencies. They're very skilled and have huge budgets and are under increasing pressure to raise the profile of their client's brand. Paul goes on to say that this might eventually damage the brand’s reputation, but for now it seems to be working.